Fall WA WA Family Day is just around the corner! With Summer quickly fading behind us, Camp WA WA Segowea is looking forward to celebrating the beauty of Fall on Harmon Pond! Alumni and new friends will be making the gorgeous drive to Fall WA WA Family Day on Saturday, October, 7th for a day with activities for everyone in the family! Fall WA WA Family Day activities are scheduled from 11 AM until 3 PM and will include pressing apples into cider, fire wood collection and fire building, a fall art craft, and canoeing if the weather is sunny! 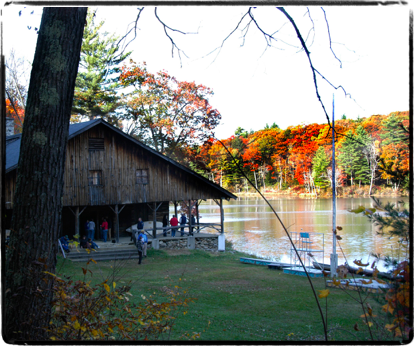 The historic camp facility is located on one of the most beautiful ponds in the Berkshires, down a dirt road hidden just outside of the small township of Southfield, MA. The Camp’s lodge, lake-side porch, and outer grounds will be open for ballgames and leaf gazing, and a simple hearty lunch will be served at noon. Fall WA WA Family Day is a free event and is open to the public. Guests are encouraged to bring apples for pressing! Please RSVP via the Facebook event or by emailing our Camp Director, Lily, at lily@smithpark.org. For more information about Camp WA WA Segowea, please visit www.smithpark.org or like us on Facebook at Camp WA WA Segowea!